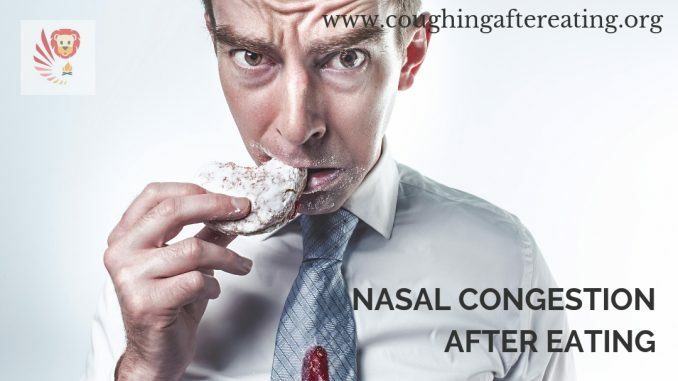 If you are experiencing nasal congestion after eating, you must be wondering ‘why do I get so congested after I eat’ . I used always wonder the same. I have asked my self what causes congestion after eating and did my research. After some research, I realised that if you have a blocked nose after eating, it is very likely that what you eat is causing it. You need to identify the foods that make you congested and stay away from them. There could be other reasons for nasal congestion like an infection, inflammation, allergy etc. In medical terms, a stuffed nose or runny nose is called rhinitis. All symptoms like runny nose, stuffed nose, itchy nose, sneezing and post nasal drip suggest some rhinitis. When you have a stuffy nose or runny nose after eating, it is called gustatory rhinitis. Gustatory rhinitis is one type of nonallergic rhinitis. Someone suffering from gustatory rhinitis is very likely to end up with nasal congestion after eating foods that trigger the condition. Nonallergic rhinitis is common in adults over 20 but sometimes occurs in children too. Nonallergic rhinitis or gustatory rhinitis is diagnosed by excluding allergies or allergic rhinitis. When you get nasal congestion after eating, you may feel a really stuffed nose or runny nose or both. With nasal congestion after eating, you may find it difficult to breathe after eating. You may feel a strong urge to clear phlegm after eating. When you eat something that your body does not like, your body produces more mucus to keep the inner membranes away from irritating substance. This excess mucus obviously causes nasal congestion after eating. It really helps to identify foods that make you congested. Knowing what causes congestion after eating in your case will help you prevent blocked nose after eating. So ask yourself why do I get so congested after I eat and make a list of foods that make you congested. Different foods work differently on different people. You may be having nasal congestion after eating certain foods and someone else can have nasal congestion after eating some other foods. There are some foods that commonly cause nasal congestion after eating in most people. You may want to maintain a diary and note the foods that make you congested. Common foods that cause nasal congestion after eating include the below. Sugar is a popular food that triggers body inflammation. When your body notices inflammation, it responds by producing more mucus. With excess mucus, you may feel nasal congestion after eating sugar. Eating sugar in small quantity may not trigger inflammation or excess mucus. So you are very unlikely to have a blocked nose after eating little amount of sugar. But when you eat too much sugar, you are very likely to have a blocked nose. If you experience stuffy nose after eating sugar, you need to try avoiding all types of sugars like honey and maple syrup and may be some grains that are rich in sugar too. You may have nasal congestion after eating rice as rice has sugar. Researches have proved that consumption of food based on dairy triggers production of excess mucus and makes the mucus thicker too. As a result you may have nasal congestion after eating food based on dairy. An episode of nasal congestion after eating yogurt, cheese, and cream is very likely too. Skimmed milk may cause less severe nasal congestion than whole milk. Ice cream can cause severe nasal congestion it contains casein. Chocolate is rich in sugar as well as dairy. So it is double trouble of nonallergic rhinitis. Chocolate being rich in sugar leads to more yeast in your body which means more bacteria. More bacteria leads to more mucus and nasal congestion. And there is good amount of milk in chocolate. Milk also triggers excess thick mucus. You are very likely to have a nasal congestion after eating chocolate as chocolate contains both milk and sugar. Wheat has gluten and gluten can stir up nasal trouble. If you are sensitive to gluten, you can have a bad reaction when you eat wheat based food or other gluten foods. Excess mucus is a common result of eating gluten foods. As a result of excess mucus, you may have nasal congestion after eating bread. Grains like oats, wheat, barley, rye, etc. contain gluten can also lead to stuffy nose after eating. Most gravy is made from flour. Flour has gluten that can trigger inflammation and excess mucus leading to stuffy nose after eating. If you suspect your non allergic rhinitis is due to gluten, you need to avoid gravy. Tomatoes are popular for anti-inflammatory function. But some people experience stuffy nose after eating tomatoes or tomato based food. stuffy nose after eating or runny nose after eating. As some tomatoes are sour, the acidic taste from tomatoes can trigger acid reflux and lead to coughing after eating. So though tomatoes are great for health, some people may have acid reflux cough or nasal congestion after eating tomatoes. Gluten, dairy and tomato can cause nasal congestion after eating. A pizza has all of these ingredients. Pizza crust has gluten, cheese is dairy, pizza sauce has tomato and all these together can really trigger serious nasal congestion after eating pizza. Eating spicy food triggers your body to produce more histamine, an inflammatory compound. So sometimes you may feel nasal congestion after eating a spicy meal. This is because, spicy food triggers more histamine production and histamine causes your tissues to swell. When your nasal walls swell, you will have nasal congestion. Alcohol can trigger inflammation very quickly and severely like sugar does. For example, wine contains histamine, beer contains gluten and both can trigger excess mucus and nasal congestion. So you are likely to have nasal congestion after eating a nice meal with alcohols like wine, beer or whiskey. Fruits are rich in vitamins and minerals but you might end up with nasal congestion after eating fruits like banana, strawberry, papaya and oranges etc. Banana, strawberry and papaya can trigger your body to release histamine which in turn causes stuffy nose. Oranges can trigger hay fever symptoms as a protein in oranges can mimic grass pollen. If you are not allergic to nuts, nuts can be great source of nutrition. But for others, nuts can trigger histamine and cause excess mucus and inflammation. People allergic to nuts are very likely to have a nasal congestion after eating food containing nuts. High protein in red meat can trigger nasal congestion after eating food made from red meat like lamb, beef etc. Tuna can trigger inflammation due to histamine. So you risk having a stuffed nose after eating red meat or tuna. On the other hand chicken soup can help help heal cough and sore throat. However, if you have an episode of nonallergic rhinitis and suffer from runny nose or blocked nose, you can apply a topical rub like Vicks or inhale steam. This will help remedy a stuffy nose.